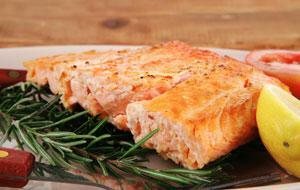 Salmon is known for its rich source of omega-3 fatty acids. Omega-3 fatty acids include fish oil, and fish oil contains eicosapentaenoic acid (EPA) and docosahexaenoic acid (DHA). EPA and DHA studies have shown that the intake of recommended amounts of each of these acids via dietary fish lowers blood pressure slightly, lowers triglycerides, reduces the risk of abnormal heart rhythms, reduces the risk of heart attack, and reduces the risk of strokes in people with known cardiovascular disease, and slows hardening of the arteries. Place tomatoes, onion, garlic and orange zest in a large roasting pan; drizzle with olive oil, then toss to coat. Roast, uncovered, for about 45 minutes, or until tomatoes and onion are tender and beginning to brown on the edges. Remove pan from oven. Increase oven temperature to 450 degrees F.
Add olives and rosemary to pan; season with salt and black pepper. Make four spaces in the pan for each salmon piece. Spoon some of the tomato mixture atop salmon. Roast for 10 to 15 minutes, until salmon is opaque in the center.